The MLSListings Facebook IDX package has no set up fees, and a month-to-month contract. 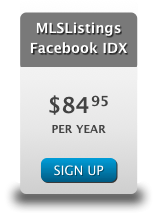 Click the SIGN UP button to order the Facebook IDX package. NOTE: You may be asked to login to the MLSListings MLS system. This enables instant approval of your IDX license and expedited account set up.